The AT3 SPEAR™ is our best, most secure handguard. Simple to install, lightweight, and easy on the wallet. The slim free-float design enhances accuracy while minimizing the weight of your rifle. 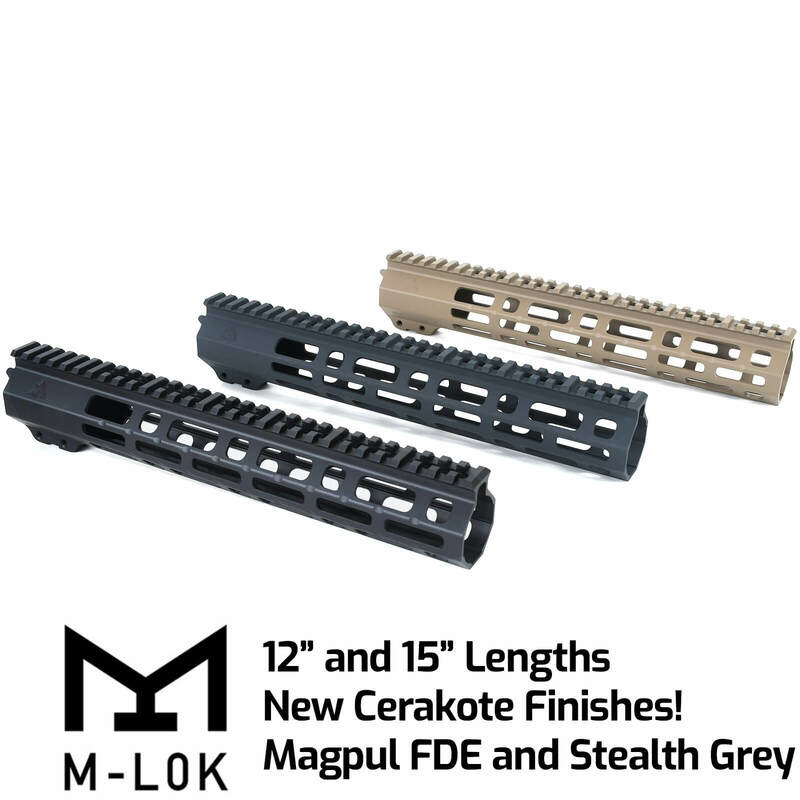 M-LOK attachment slots and included rail section provide unlimited options for accessorizing your build. And with an available Billet Upper to perfectly match the slim profile, the SPEAR (Slim Profile Ergonomic Adjustable Rail) creates a unique look to set your rifle apart. With 9″, 12”, or 15” lengths available, the SPEAR handguard is ideal for customizing your next AR-15 build, or upgrading an existing rifle. If you’re starting from a stock rifle, make sure you purchase a Low Profile Gas Block with the handguard. Installs clean and secure with only a few simple steps – all you’ll need is a torque wrench, vise block, and vise. Click here to view our instructions. Full kit – includes all mounting hardware, plus one M-LOK 5-Slot Rail section and barrel nut wrench. Handguard with aluminum barrel nut and all mounting hardware, one 5-slot M-LOK to-picatinny rail, hex wrenches for handguard and rail sections, and barrel nut wrench. The SPEAR is specially designed for use with our matching Billet Upper Receiver as well as the majority of mil-spec AR-15’s on the market. In most instances, it will also require the use of a low-profile gas block that fits underneath the rail. Want to see the SPEAR in action? Check out 704 Tactical’s Review! The fit and finish of this handguard was perfect!!! Super easy installation!! Directions were clear and concise. This will be my go to handguard for all my future builds. Another excellent product from AT3!! 15 inch Spear rail, has exceeded my expectations. Compared to some of the "other" rail systems out there. Very light weight and milled very well, plus I couldn't beat the price. All in all I am very satisfied with this product, I will be purchasing again for future builds! I love it. Fits on my Aero Precision upper perfectly. Have not shot yet, but seems to be very comfortable. Great build quality, Install is very easy, would definitely buy again!